Choosing the right resort when visiting Universal Orlando is important. There are many available on-site properties at Universal Orlando ranging from prime value to premier categories with the prices to match. 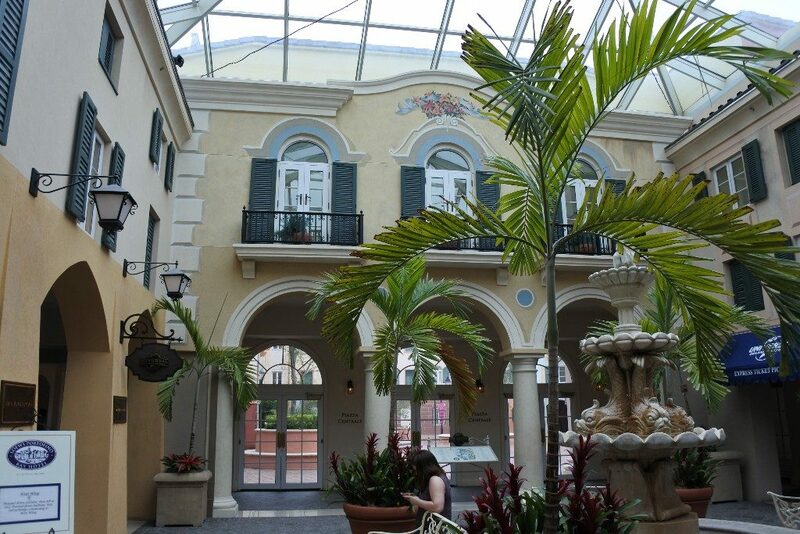 Loews Portofino Bay is one of two premier resorts at Universal Orlando and is a beautiful luxury option. Loews Portofino Bay reminds me so much of a luxury Las Vegas resort. The hotel is a large, sprawling property with many different room types, restaurants, shops, and beautiful common areas. The Italian theme is found consistently throughout the resort and is well thought out. Behind the hotel is a picturesque bay complete with colorful, moored boats framed by walkways, shops, and restaurants. There are even a few Vespa scooters secured into the ground for fun photo opportunities. Our favorite thing about Loews Portofino Bay is Musica della Notte (live music each evening). Every night singers stand on a second floor balcony and perform songs for about 30 minutes to the Harbor Piazza below. The time for the show varies depending on sunset so check with the front desk. You will find tables and chairs in the plaza where you can relax while you enjoy the performance. Pro tip: About 15 minutes before the show grab a coffee from Starbucks, gelato from the Gelateria, or a glass of wine from The Thirsty Fish so you can really kick back and relax during the show. 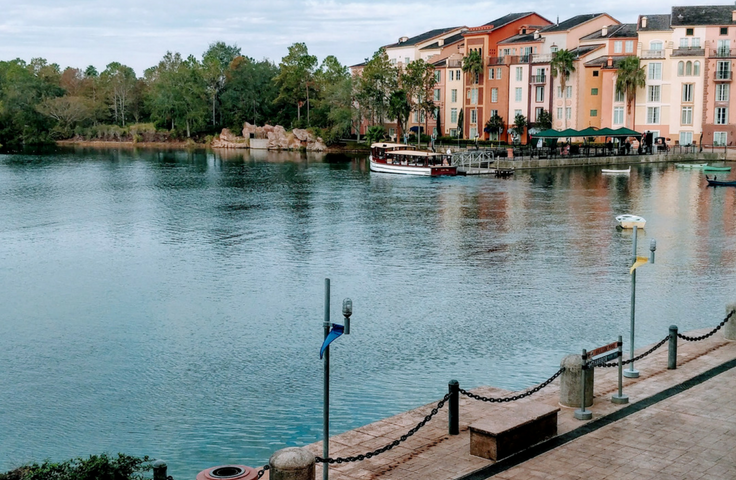 There are several on-site restaurants to choose from at Loews Portofino Bay ranging from quick meals and snacks to full fine dining options. Mama Della’s – We ate dinner at Mama Della’s and loved that musicians came and sang table side throughout the restaurant. The food was fantastic and the atmosphere was like being at a cozy home. Bice Ristorante – Bice offers northern Italian cuisine for dinner nightly. Trattoria del Porto – Breakfast is served here each day and on select days lunch and dinner is also served. Sal’s Market Deli – Here you will find sandwiches, pizzas and salads served for lunch and dinner in addition to other snacks. Splendido Bar and Grill – find burgers, sandwiches and other snacks conveniently located near the pool. Gelateria – What Italian inspired stay would be complete without gelato? Starbucks – Great for a quick breakfast or anytime pick me up. The Thirsty Fish – A casual bar with some appetizer options. Bar American – Another bar option with appetizer options. There are three lovely looking pools at Loews Portofino. The main pool (The Beach Pool) is surrounded by sand, has two Jacuzzis, a children’s pool and a waterslide. The Villa Pool is a quieter area with upgraded lounge chairs and cabanas available. The Hillside pool is located on the east wing and is billed as a more private and quiet pool option. Unfortunately, the pools were closed during our visit because of inclement weather. We opted for a basic garden view room for our stay. It was a very long walk from the lobby to our hotel room, but because of the distance our room was very quiet. We found our walk to the boat dock and plaza was shorter than the walk to the lobby. Our room was plenty spacious. We could spread out despite two queen beds, a desk with two chairs, an armchair with ottoman and large TV stand/dresser combination. Inside the TV stand there is a mini fridge which I feel is such a great convenience. The bathroom has a nice size bathtub, a double vanity (which helped us get ready simultaneously and save time), and a small corner shower unit. 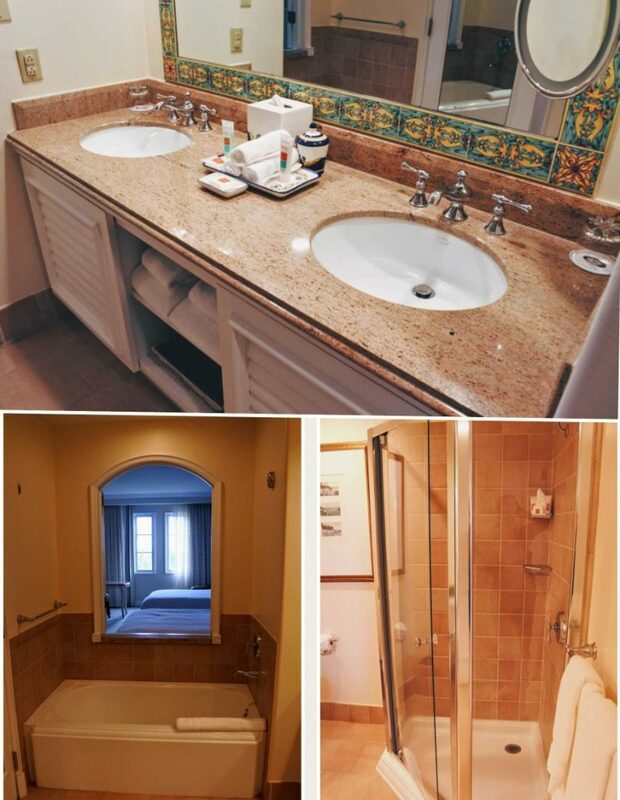 The bathroom overall was quite large and suited us well except for the shower which was on the small side. There is also a coffee station located just inside our hotel room. The coffee bar was consistently stocked and the Keurig made a lovely strong cup of coffee to help us get going. This hotel is considered a “premier on-site resort”. There are only two of these premier resorts: Portofino Bay or Hard Rock Hotel. One of the main reasons to choose a premier on-site resort is an Express Pass is provided to guests at no additional charge. Express Pass is a ticket which allows you to skip lines at Universal Studios Florida and Universal’s Islands of Adventure for select attractions. Find out more about the Wizarding World Of Harry Potter Orlando here. 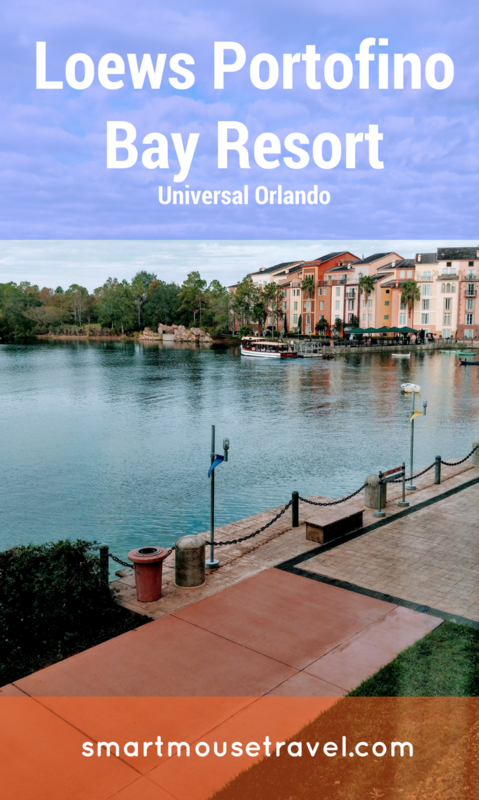 This bay area is where you can access either the boats or walkways to reach Universal CityWalk, Universal Studios Florida or Universal’s Islands of Adventure. We found a boat waiting at the dock each time we were heading to the parks so we never did the walk. We very much enjoyed our relaxing boat rides to and from the parks. Please note: Shuttle boats do not run in inclement weather. If the boats are not running a shuttle bus (found near the parking garages past CityWalk) will provide transportation back to Portofino. Overnight guest parking has two options. There is self parking at $22 plus tax per day or valet parking at $29 plus tax per day. 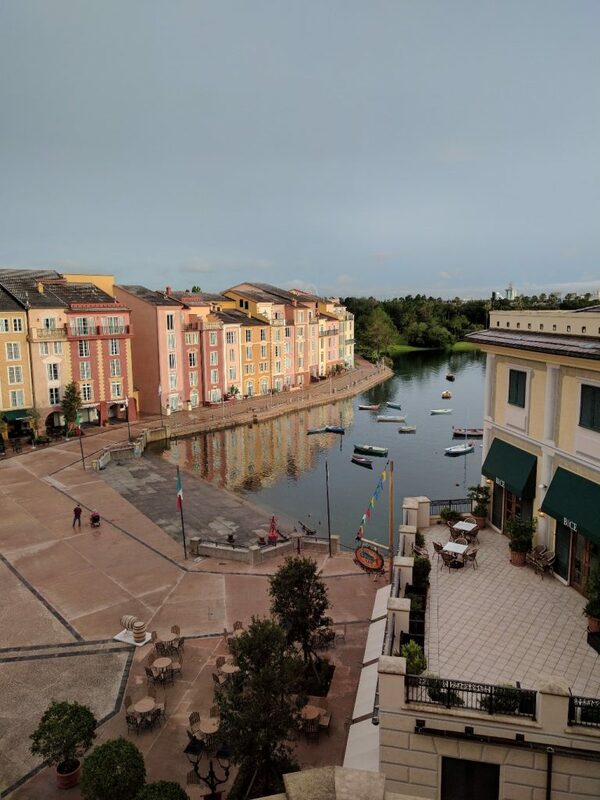 The Loews Portofino Bay Hotel surpassed every expectation I had. I opted for the least expensive room and still had a spacious bedroom area, a well stocked coffee bar, a mini fridge, a bathroom with a double vanity and quiet accommodations. 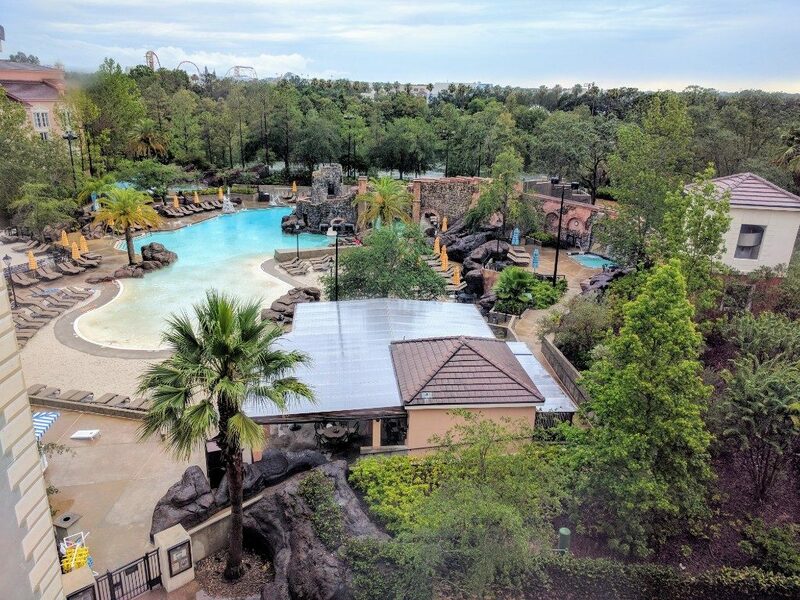 The location makes access to City Walk and the Universal parks easy, but is far enough away you can easily forget you are visiting a theme park. In fact, we enjoyed our stay so much that we intend to stay there on our next trip to Universal Orlando. 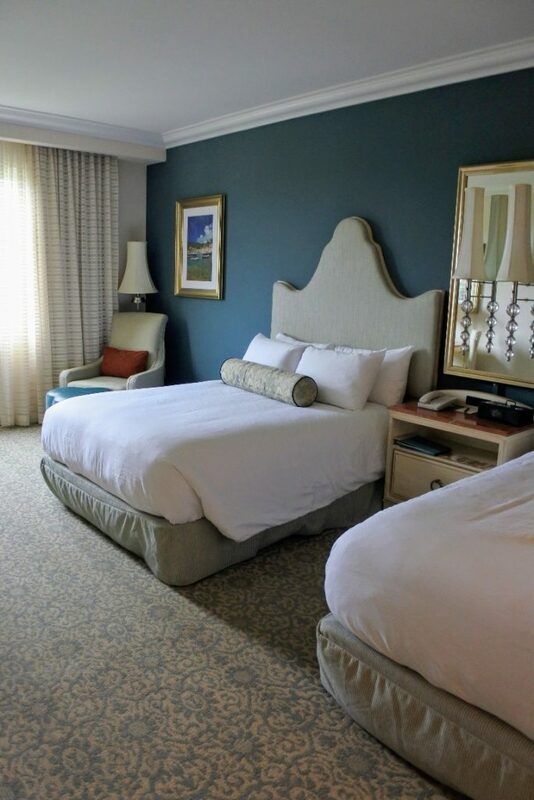 Have you stayed at Loews Portofino Bay Hotel in Orlando? What was your favorite thing about the resort? Previous Post:Is Mickey’s Not-So-Scary Halloween Party Worth The Expense?